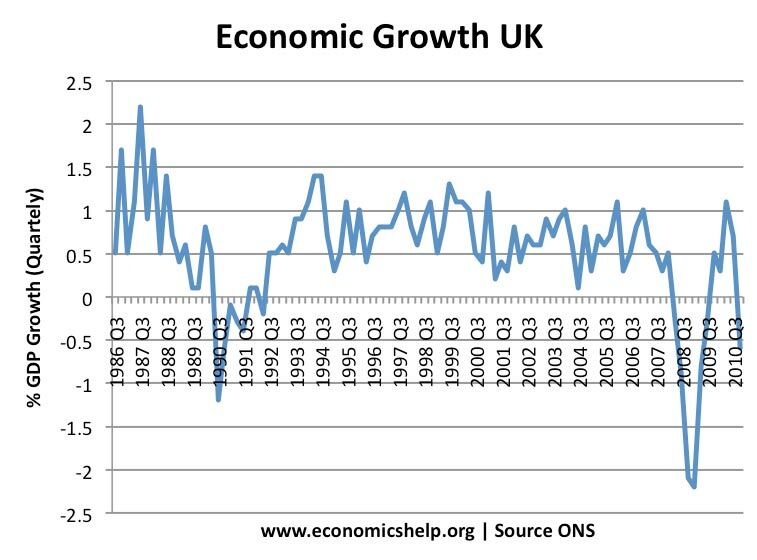 Readers Question: What is the UK’s target for economic growth? However, the government will aim to achieve economic growth close to the long run trend rate of 2.5% (about 0.7% per quarter). The long-run trend rate of growth is the average sustainable growth rate over a period of time. This is a growth rate consistent with low inflation. A growth rate of 2.5% will typically mean aggregate demand grows at a similar rate to Aggregate supply. In theory, a growth rate close to 2.5% will lead to full employment. In some circumstances, after a recession, there will be a negative output gap and spare capacity. In this situation, the economy can grow faster than the long run trend rate without causing inflation. 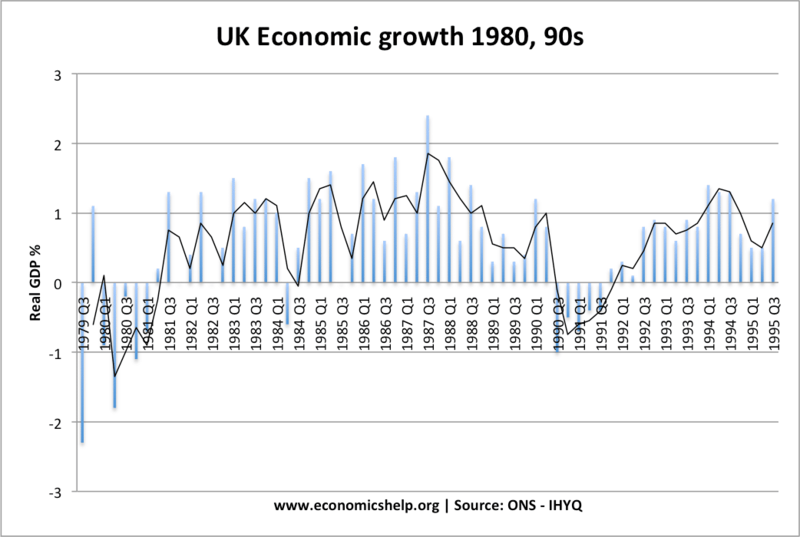 For example, after the recession of 1991-92, we had growth of 4% year (quarterly growth of 1-1.5%), but it didn’t cause inflation because we had spare capacity left over from the recession. There is a trade-off between growth and inflation. By targeting low inflation (2%), this may require higher interest rates and higher taxes. Therefore if the government and Bank of England stuck to its inflation target, it may cause a trade-off of lower economic growth. For example, UK inflation has recently exceeded its target of 2%, but the Bank of England has not sought to increase interest rates because it is concerned about the impact on economic growth and they hope the inflation is temporary. Another trade off governments face is that between economic growth and reducing the budget deficit. 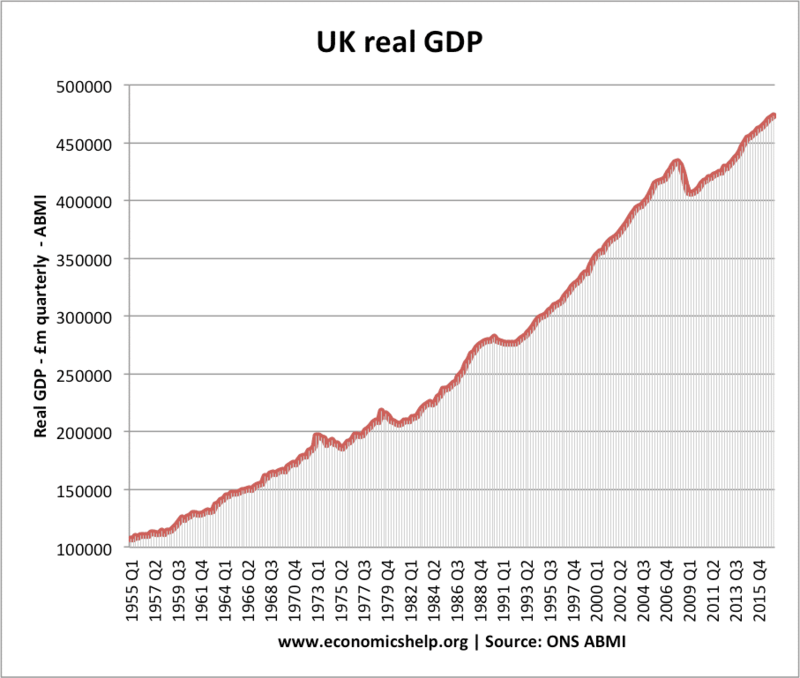 By targeting a reduction in the budget deficit, (government spending cuts) we are likely to get slower economic growth. Should a Growth Target be given a Higher Priority? Arguably sometimes Central Banks give too much importance to low inflation and not enough to targeting higher growth. For example, despite the prospect of economic recession in areas of the Eurozone, the ECB are warning of interest rate increases to target low inflation. By seeking to maintain higher growth, the economy will be more successful in job creation and reduce unemployment.